Today in Berlin Microsoft announced two new midrange Windows Phones, as well as several accessories to compliment the Windows Phone ecosystem. 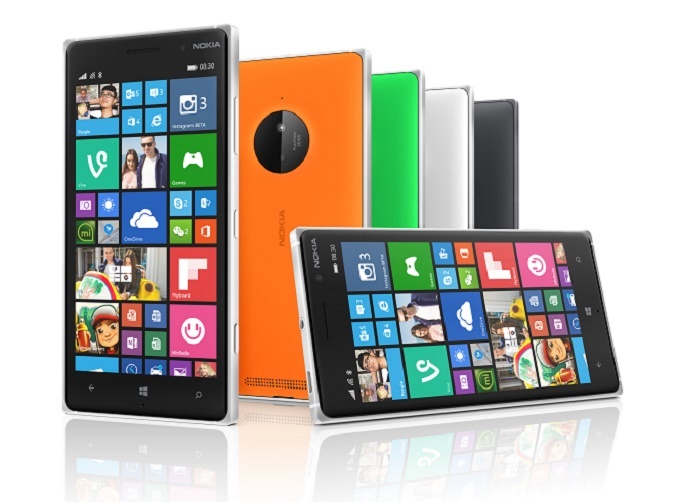 We now have the rest of the phones to fill out the Lumia lineup with the Lumia 730/735 and Lumia 830 announced today. As well, there is a new wireless charger to match this year’s Lumia color lineup, and a Miracast enabled screen sharing device to allow the broadcast of your phone (or anything Miracast compatible) onto a television. First up are the 4.7” Lumia 730 and Lumia 735 models which are “built for Skype calls and selfies” as described by Microsoft. These devices integrate a wide-angle 5 megapixel front facing camera with a f/2.4 aperature which is the feature point of this midrange phone. The internals are similar to the Lumia 630/635, with the Qualcomm Snapdragon 400 (MSM8926 is listed for both devices but the 730 is likely MSM8226 due to the lack of LTE) and a bump in memory over the less expensive cousins with 1 GB in these new models. Storage is 8 GB internal memory, with support for 128 GB microSD cards. The display is a 1280x720 AMOLED for 316 PPI, and has a curved glass on the front in addition to ClearBlack, SuperSensitive Touch, High Brightness Mode, and Sunlight readability enhancements. The rear camera also looks to be good for a mid-range phone, with a 6.7 megapixel sensor with Zeiss optics and a f/1.9 aperature as well as LED flash. NFC is included, as well as optional Qi wireless charging of the 2220 mAh removable battery via an exchangeable shell. To round out the experience, a new Lumia app has been created just for this model – Lumia Selfie. 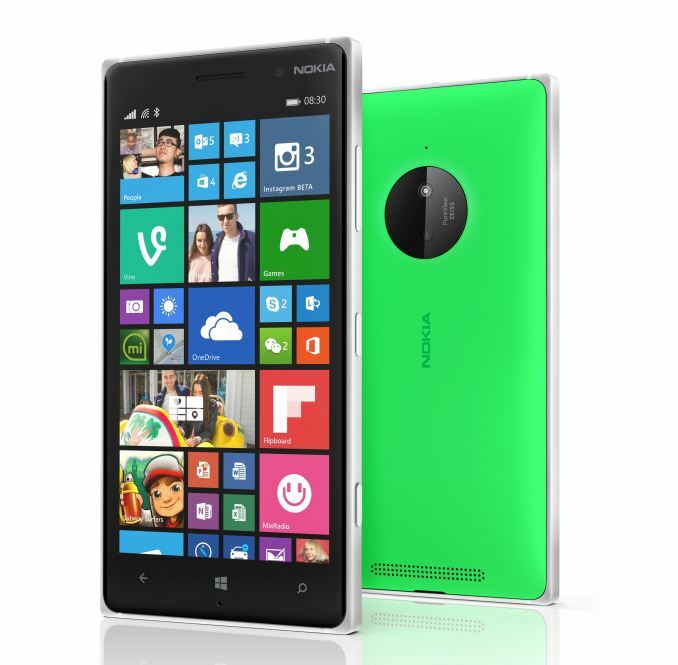 The final phone to fill out the Lumia line is the Lumia 830. This device bumps up to a 5” display, but keeps the same resolution as the 73x models at 1280x720 as well as the curved glass. The SoC also stays the same, with the 1.2 GHz quad-core Snapdragon 400 (MSM8926) and 1 GB of memory, but the storage is bumped up to 16 GB internal NAND as well as up to 128 GB extra storage from microSD. The rear camera gets a spec bump up to a PureView 10 megapixel model with Zeiss optics, Rich Recording (3 HAAC microphones for up to Doiby 5.1 audio recording), and Optical Image Stabilization (OIS) which has been tweaked for the 830 with Microsoft claiming it to be the thinnest OIS of any Lumia phone to date. 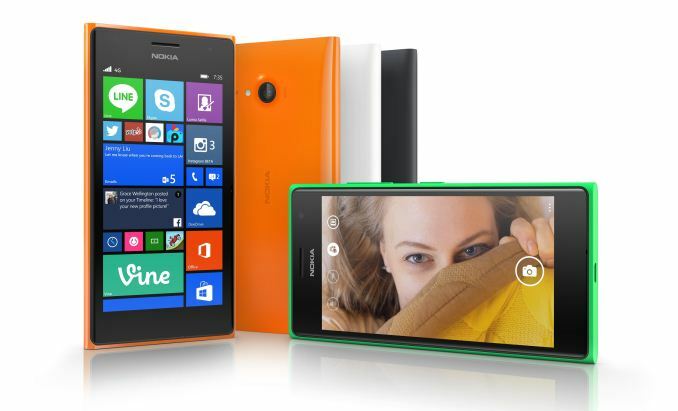 The Lumia 830 can also charge its removable 2200 mAh battery with Qi wireless charging. NFC is not listed, but due to the accessories coming up it seems likely it is included. All of the phones announced today will ship with Windows Phone 8.1 and the Lumia Denim firmware update which brings some big features to the camera functions. The new firmware will allow for a new version of Lumia Camera (formerly Nokia Camera) and add a series of enhancements over what is currently offered. The new Lumia Camera improves camera startup and capture speeds, with Microsoft claiming only milliseconds between shots. 4K video recording is now available, with a long press of the camera button within the camera app. 4K video will be at 24 frames per second, and any single frame can be selected and saved as an image. Rich Capture adds the HDR mode that has been missing since, well, forever in Lumia Camera, and includes auto HDR and Dynamic Flash which lets you edit the photos after the fact to perfect an image. Finally, updated low-light algorithms improve the already impressive performance of PureView cameras in dim scenarios. The updated Lumia Camera app will come to the Lumia 830 in Q4 2014, and to the Lumia Icon, 930, and 1520 as part of the Denim firmware update following partner testing and approvals (read carriers). In addition, two accessories were revealed today. First, there is a new Wireless Charging Plate. 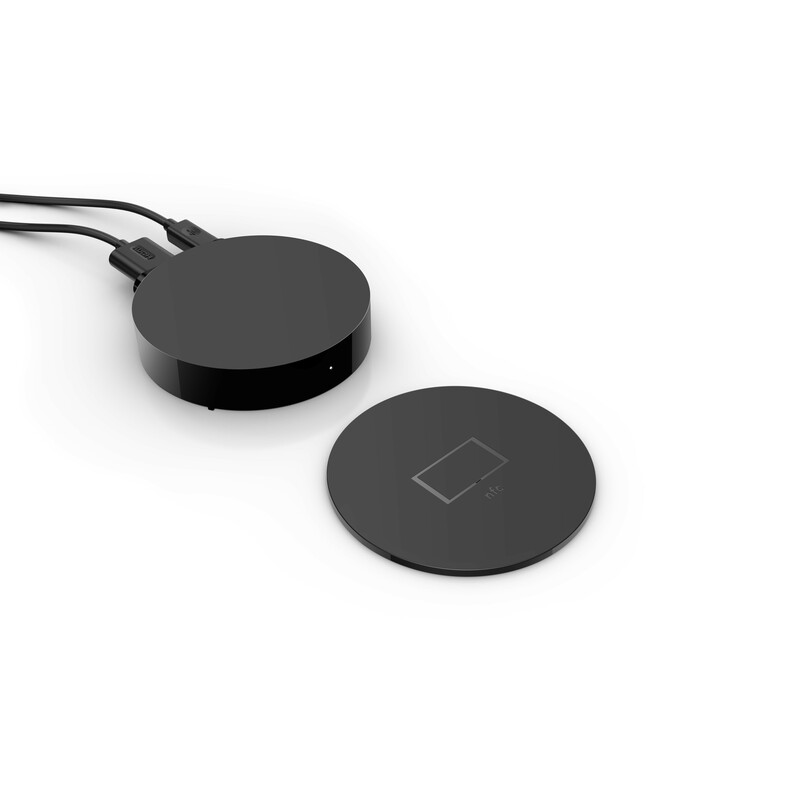 The charging plate connects to the phone over Bluetooth which allows the plate to give status updates for the phone, and will even alert you if the phone needs to be charged. The charging plate will perform a “breathing” light to invite you to charge your phone if the device paired to it has 30% or lower battery. In addition, the charging plate will give two blinks to display notifications such as a missed call or SMS message. While charging, the plate will show a continuous light, and if there is a charging error, it will continually blink until the issue is addressed. 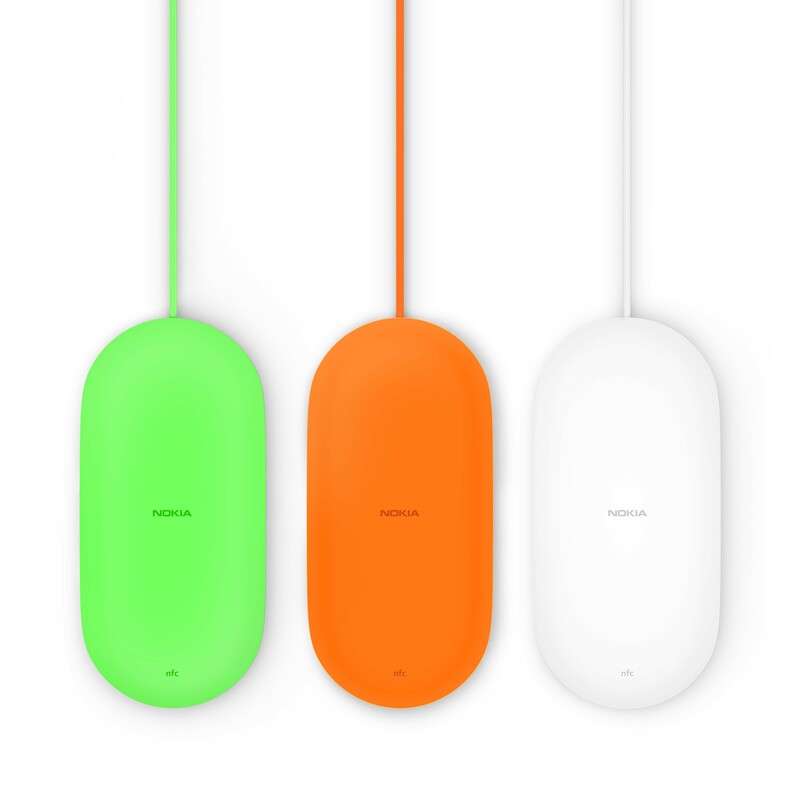 The Nokia Wireless Charging Plate is available in green, orange, or white to match the 2014 Lumia colors. Pricing is expected to be $59 USD and EUR 59, with availability in October. The final accessory is the long named Microsoft Screen Sharing For Lumia Phones HD-10. This Miracast receiver allows you to beam your smartphone display and audio to any HDMI TV or monitor. The HD-10 is NFC enabled, allowing easy pairing by just tapping a phone on the NFC disc, which is removable as well so the disc can be kept away from the receiver. Being Miracast, the device is compatible with any Wi-Fi certified Miracast product. Availability is September with a MSRP of $79 USD and EUR 79. The new smartphones look like nice mid-range devices to fill the huge gap that exists between the Lumia 630 and the Lumia 930. Pricing was not available, which will be the key to where these fit in the market, but there again is a large gap between the Lumia 630/635 which is already available for $99 or so, and the Lumia 930 which is closer to $600. The bump to 1 GB of RAM and the display resolution increase are the most important additions to these devices to pull them away from the low end 630. Both the 730 and 830 have decent looking cameras, with the 830 even being added to the PureView stable now with OIS to back the 10 megapixel sensor. The charging plate looks quite interesting, and having it pair with the phone via Bluetooth is a nice trick. The Miracast receiver is the one thing that Miracast needed more than anything, assuming it works well and is as easy to use as indicated. The inclusion of NFC should assist for smartphone users at least for initial setup. The article seems to suggest that 4K recording is coming to the Lumia 830. Really disappointing how they tried to push the 830 as an affordable flagship when ,at this point, they shouldn't even use A7 in anything above low end.That kind of outrageous dishonesty is not what they should base their strategy on. And the pricing is poor, 330 euros before taxes for the 830 are getting it close to the HTC E8. They were touting the 830 as a flagship at mainstream pricing, what we are getting is a decent camera phone with a crippled SoC. If it had come with an SD600 that would have still been mid range but at least a decent SoC, the 400 is just disappointing in anything other a low end device in mid 2014. I was really excited to see the rumours but was fearful the SD800/801 was not going to make it into the device, that is fine but to stick a 400 in it is just typical MS being shortsighted. The Lumia 930 should never have had a 16Gb option and it should have included an SD card slot, no decent camera phone is usable at 16Gb. If you want to keep a decent collection of photos and video then 16Gb is entirely unusable. Keeping media in "the cloud" is not feasible for the majority of people outside of a major city with 4G connection. I know that on paper S400 does not sound as impressive as S800, but on promo materials it's gonna say "Quad core" so it does not really matter to the type of customer they want to attract. Also, if the SOC is strong enough to handle photography well enough, that's all that it needs really. WP can run very smoothly on that kind of silicone, IMHO. pricing should be better though. But WP device prices fall very quickly. They will settle lower very quickly.